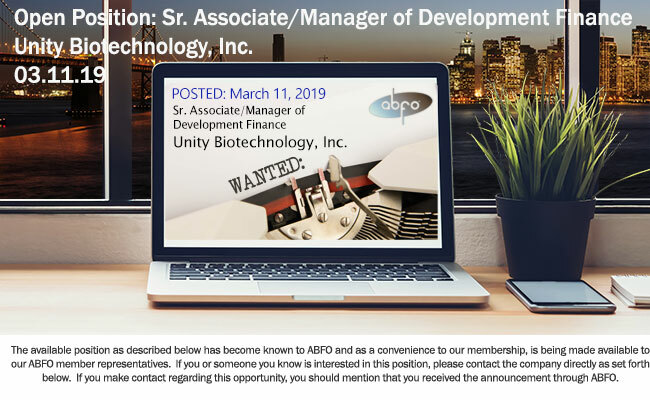 Unity Biotechnology, Inc. (UNITY) is a clinical-stage biotechnology company developing therapeutics to extend healthspan by slowing, halting or reversing diseases of aging. We are located in the San Francisco Bay Area and are seeking to hire a highly motivated senior associate / manager of Development Finance to support our Clinical Development teams. The successful candidate will have strong finance skills with experience in early clinical trial start-up activities. Assists clinical teams in resolving financial issues as they relate to either site or vendor contracts. May have contact with external customers in regards to payment issues.